A specialist North East manufacturer is looking to build on its international underwater success by targeting new markets with new products. Orcalight manufactures the world’s most powerful dive light, which is the main light to have been used in the filming of the BBC’s forthcoming landmark natural history programme Blue Planet II. 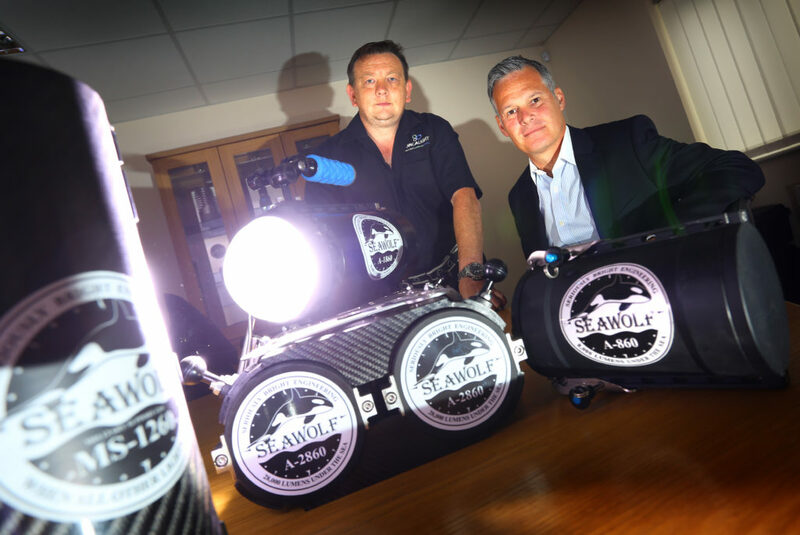 The County Durham-based firm was originally approached by Doug Anderson who was filming for the BBC in 2013 to develop a one-off, high-quality LED dive light for a special test, and they were so impressed by the results that they suggested that it should be manufactured on a commercial basis. After carrying out research and development work on prototype products with some of the world’s leading underwater professionals, the 22,000 Lumen Orcalight was officially launched in 2015 with the help of a six-figure investment from the Finance For Business North East Growth Fund which is managed by NEL Fund Managers. Since then, Orcalight has become firmly established as a leader in its field, with sales of the light being channelled through its www.orcalight.co.uk website and a network of distributors and resellers. Its client list also includes The Discovery Channel and National Geographic alongside The BBC Natural History Unit, and the firm’s management team is now looking at developing a new generation of products which will be used in a range of different environments, as well as investigating new commercial relationships with other companies. Orcalight founder and CEO Shane Newman says: “The Orcalight Seawolf range has proven itself extremely reliable, very powerful and tough enough to work in and out of water in every pole to pole environment its thus far been deployed in. “To have it selected as the light of choice for use on the underwater sequences in Blue Planet II is a real testament to its quality, and we’re excited to see the results when they’re broadcast later in the year. “Our progress in the professional and recreational diving markets, and client testimonials provide a great pedigree on which to build a range for area lighting of the highest marine standards. “We’ve had a lot of interest from other businesses already, and have a tried and tested core technology base to now offer OEM products rapidly to companies who share the vision. “There remains years of research and development work on expanding upon the core range with new innovative solutions, with our core aim to not only remain world class in underwater provision and service but also establish ourselves as a world leader in high end solutions for the larger market. “Critical to achieving what we have thus far was the early investment received from NEL – they had the ability to look more broadly and contextually at the products, technology and potential, rather than just our balance sheets. Jonathan Luke, portfolio manager at NEL Fund Managers, adds: “Orcalight is an innovative North East product that has achieved a strong presence on a global stage, and it couldn’t have a better showcase for its capabilities than Blue Planet II.